What does getting a tattoo feel like? You can imagine: when a tattoo is being applied, the needle enters and leaves the skin around 20 times a second or 1,200 times a minute. This means that no matter what, a tattoo will hurt to some extent. Despite the pain, so many people still get tattooed. According to statistics, 36% of Americans between 18 and 29 have one or more tattoos while 16% of those of all ages have a tattoo. How Does Getting a Tattoo Feel? When trying to figure out "What does getting a tattoo feel like? ", you have to remember that it will be different for everyone based on their pain tolerance, the location of the tattoo and other factors. Technology has made it less painful and easier to apply tattoos, leading to an increase in their popularity. In fact, the number of people with tattoos has almost tripled within the past six decades. Getting a tattoo may feel like a cat is repeatedly scratching you. Other people say it feels like a cat with a very rough tongue is licking you. Some people even say that getting a tattoo is just like that a cat keeps scratching you, but at the end you have to pay for it. Other people answer the question of "What does getting a tattoo feel like?" by saying that it is like scratching a sunburn or the pain associated with a sunburn while it heals. The majority of people don’t necessarily find the pain of getting a tattoo to be overwhelming. Instead, many people think that it is just irritating. Descriptions range from simply being bothered by it and getting more irritated as the inker continues, which feels like an annoying child is poking you repeatedly. These people may say that you need to rely on your mind to stay collected and calm. To other people, getting a tattoo feels exactly like what it is: being poked or stabbed repeatedly with a needle. Some people compare the pain of a tattoo to physical pain with it concentrated in one area. If you have decided to have a tattoo, except "What does getting a tattoo feel like? ", you should know what the procedure is. Here are 4 steps on how to get a tattoo. Tattoos carry a risk of getting certain diseases and infections because they are technically wounds. Always ask your doctor before getting a tattoo if you are pregnant or have skin disorders, allergies, diabetes, heart disease or a condition that affects the immune system. Make sure that you select something that you love and want to live with. 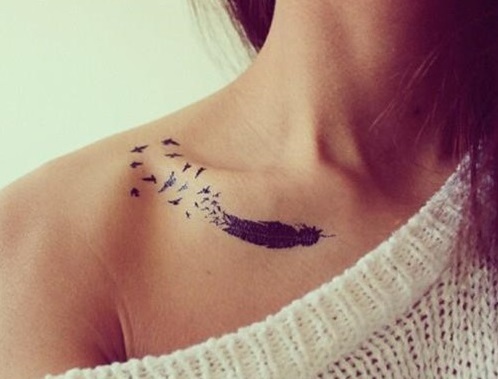 Now, make a basic sketch of what you want the tattoo to look like and decide where it will go. Take the time to make sure your tattoo design looks perfect and unique. The studio follows the Universal Precautions from the Occupational Safety and Health Administration. The tattoo artist will go over the general procedure with you and you can negotiate a price. Expect to leave a deposit of some sort and give him the tattoo design so they can refine it. Don’t shave the area to be tattooed because the artist will do that to make sure you don’t damage the skin. Before the tattoo artist starts the process, make sure that you see and like the improved tattoo design. At this point, you will soon find out "What does getting a tattoo feel like?". After the tattoo is finished, examine it to make sure it doesn’t need touch ups and follow the aftercare instructions, such as bandaging the area and washing it with antibacterial soap. When you look for a tattoo idea, avoid Pinterest or Google, which will give you a tattoo that looks like everyone else's. Instead, try to find a good artist and look at their work for inspiration. Instagram might be a good source. Remember that you will have to pay more to get a good tattoo, but it will be worth it. Pricing will be based on where you are, the size of the tattoo, where it goes and the tattoo artist. Good tattoos may cost as little as $50 in the case of smaller designs or elaborate works may cost a month’s rent. Communication is key for getting a good tattoo. The best ideas will be the result of collaboration between the artist and the customer. Make your requirements clear and accept great advices from your artist. Always proofread your tattoo if it has words. Pay attention to all the tiny details in your design. Right after it’s done, your tattoo will seem perfect. It’ll scab in a way like cuts do and give you a sunburn sensation during healing. Don’t pick it as this prevents healing. It should heal within two weeks provided you moisturize and clean it properly.